This is a big deal people. Big. 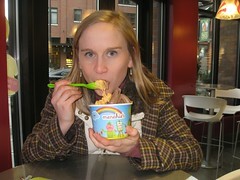 Today is National Frozen Yogurt day [Learn more]. Finally people are "getting it" - taken them years to realize what I've known practically my whole life. Frozen Yogurt is the BOMB. (<--do people still use that phrase?). Anyone that becomes my friend finally sees the light after my insistance upon the glory of froyo (and forcing them to go ALL the time). 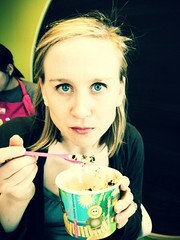 I've even created other froyo monsters along the way. I think my friends in Germany and Holland are mad at me because I got them to love the stuff and then they returned home and couldn't get it anymore. 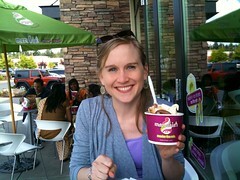 I'm glad I'm able to impart the love of froyo around the world. Perhaps that's why people call me the Froyo Queen (or, the fact that like 5 people send me the article about it being National froyo day). 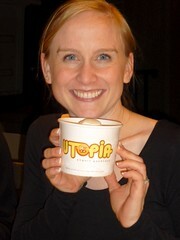 In honor of National Frozen Yogurt day, I shall tell you about the beginning of my love for froyo. It started when I was in junior high. My soccer team had a pizza part in the Ralph's shopping center in Encinitas. Some of the team members left saying they were going to get dessert. I shrugged and kept at the pizza place. When the girls returned, I saw the deliciousness in their hands. I HAD to HAVE some. So I gathered some other friends and trip #2 to the froyo shop ensued. I got vanilla with oreo topping. Heaven in a cup. I remember the night vividly. The froyo shop was called Penguins. It's not there anymore, but it'll always remain in my memory. And now, in it's place, there are mega froyo chains: Menchies, Yogurtland, Red Mango, Pinkberrys (the last two are more tart, ehh, not quite the cookies n' cream brands that are my fav). Awesome. Now do your duty and go get some froyo.